Those of you who know my jewelry are probably aware that one of the significant components of my artistic range is my line of voodoo charms. Somewhat of a pioneer myself in the manufacture of Vodou themed jewelry, I am the only designer in the world who creates the veves in a three-dimensional form that is classic, elegant, and tangible in the same way that Christian crosses and crucifixes are for those who devoutly practice their faith. 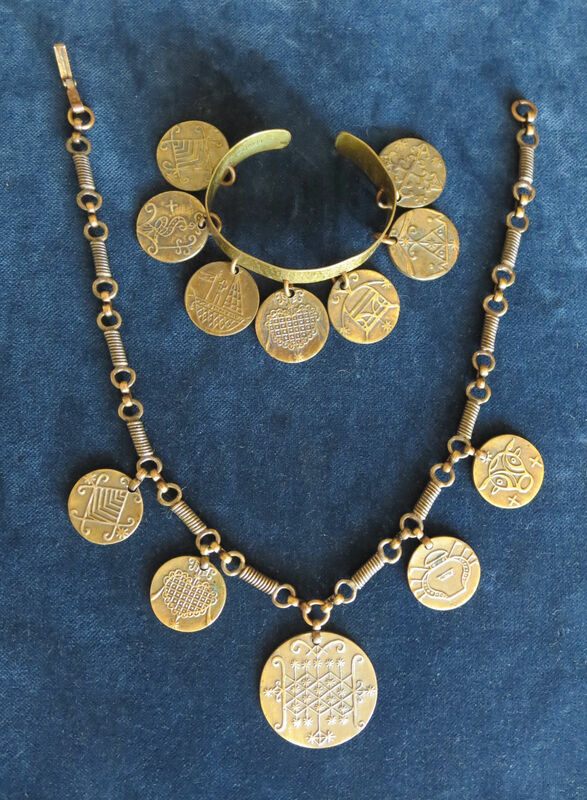 Because of this I am absolutely thrilled to have just acquired this extremely rare vintage set from 1965 by jewelry designer and coppersmith Winifred Mason Chenet, an American Modernist pioneer in jewelry design from the 1940’s to the 1970’s. She had a shop in Greenwich Village and later created a line for Bloomingdale’s and other stores. The symbols are voodoo veves which relate to the Vodou saints. A couple months ago I had found an intriguing Modernistic cuff with voodoo symbol medallions on RubyLane, an online marketplace for vintage and antique items. I didn’t know anything about the artist, Winifred Mason Chenet, her background, or the history of her intriguing jewelry. I fell in love with the piece but choked on the $165 price because, after all, it was only made out of copper! The next day I spent some time researching Chenet d’Haiti online and, realizing the artistic, historical, and investment value of it, went back to buy the cuff only to find that, at that price, it had been snapped up earlier that day. I spent the next two months kicking myself for not jumping at the opportunity to buy something so uniquely rare and so pertinent to my own jewelry design. In the meantime my son found an original WW2 bomber jacket that I bought for him without blinking an eye at the price because, I reasoned, it was a gift. Which made not buying that voodoo cuff even more of a painful kick in the head under the circumstances. From then on I became obsessed with finding another one, something that clearly was going to be like trying to find a needle in a world full of haystacks. Really, what were the odds? I had never seen one before in all my research on voodoo art and jewelry design. I did manifestation meditations, law-of-attraction affirmations, bathed my desire in reiki energy, even appealed to whatever saints might be interested in listening. Somebody heard me. The moment I found the cuff again on ebay, and being sold as a set with a bonus matching necklace even, I nearly fainted dead away. I would have mortgaged the house to win that auction. As it turned out, I was able to pay much less for these two exquisite pieces than I had anticipated, and can hardly sit still waiting for them to arrive in the mail. This quest has been a valuable lesson for me in many respects, all equally important. 1) Go with your gut feeling even if it seems ridiculous at the time; stop second-guessing your intuition, 2) Don’t give up your goal in defeat, because you just never know when a divinely ordained second chance may come along to smack you upside the head, 3) Do not, whatever the circumstances or situation, ever underestimate the power of manifestation. I grew up in a family that believed that thoughts become physical realities. The concept that bad thoughts can turn into physical illness or that good thoughts are rewarded with good health (Christian Scientist) is not new to me. I’ve had a copy of The Manifestation Process by John Randolph Price within arm’s reach for over twenty years. My step-mom is a holistic healer and minister who has given me decades of guidance on how to create abundance and I, myself, am a reiki master and healer, so I know well the power of consciously directed energy. But still, the process that led me to acquire this exceptional jewelry has been awe-inspiring and profoundly epiphanic. If I ever had doubts before about the existence of sacred energy and divine forces unseen I no longer have them now. It has been a very humbling week during which I have been graphically shown, by my own example, just how much of an impact a single thought can have.